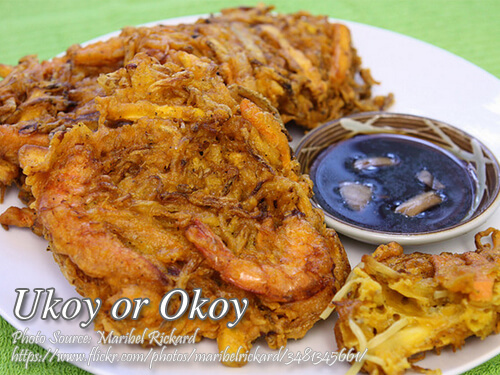 Ukoy or sometimes called okoy is a combination of mung bean sprouts, small shrimps, flour, cornstarch, egg, salt and pepper which is mixed to form a batter. Then deep fried until it forms into round shaped crunchy patties. The vegetable used can vary sometimes shredded papaya or shredded cabbage is used. When buying small shrimps in the market, salt water shrimps is better because the shells are not as hard as the fresh water shrimps. Sometimes instead of using fresh shrimps, dried shrimps is a better alternative because the shells is crunchier when fried. Ukoy or sometimes called okoy is a combination of mung bean sprouts, small shrimps, flour, cornstarch, egg, salt and pepper which is mixed to form a batter. In a bowl combine flour, cornstarch, salt, pepper, egg and water. Beat with a whisk or fork the ingredients until it forms a smooth batter. Then add the shrimps, bean sprouts and shredded carrots. Mix until the three ingredients are wll coated with batter. In a deep frying pan, heat cooking oil until hot. Then using a laddle or sandok, scoop about ⅛ cup of the mixture and pour in hot cooking oil. Cook each side for about 3 minutes or until golden brown and crispy. Place on a colander or paper towel to drain excess oil. Cooking may vary depending on the cooking oil temperature and size of the fritters. Do the same cooking method on the rest of the mixture. Serve with a mixture of vinegar, sliced onion, crushed peppercorns and crushed garlic dipping sauce. I didn’t know you can use dried shrimps on okoy. Anyway thanks for this recipe!